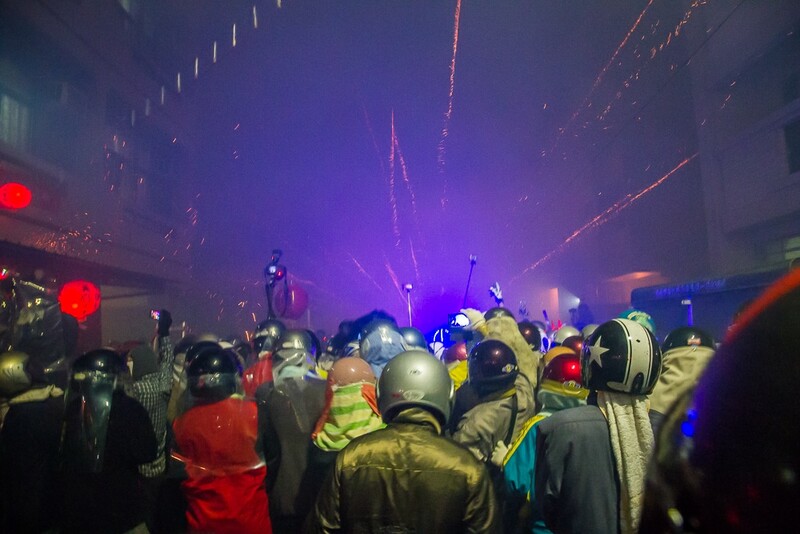 The notorious Taiwanese folk festival goes by many names: Yanshui Fireworks Festival, Yanshui Beehive Fireworks Festival, or Yanshui Beehive Rockets Festival, while locals call it Yanshui Feng Pao (鹽水蜂炮) or ‘Yanshui Bee Canons’. 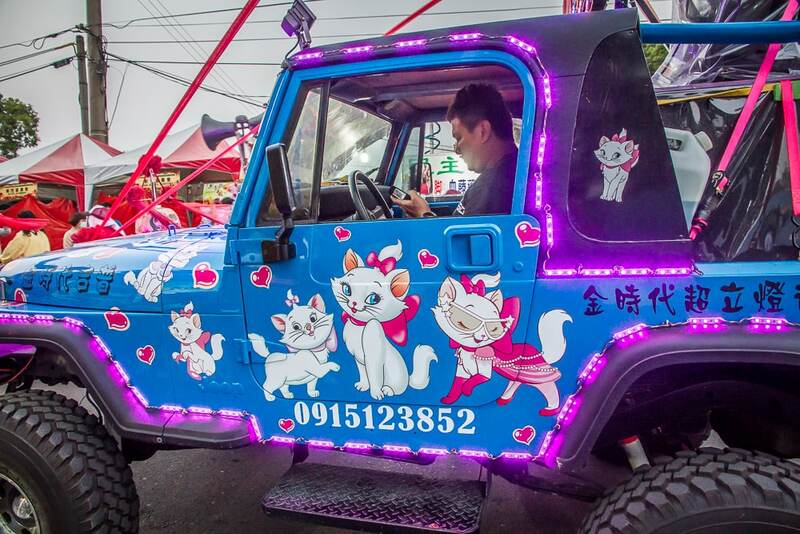 There’s no doubt that this is one of the most exhilarating things to do in Taiwan. 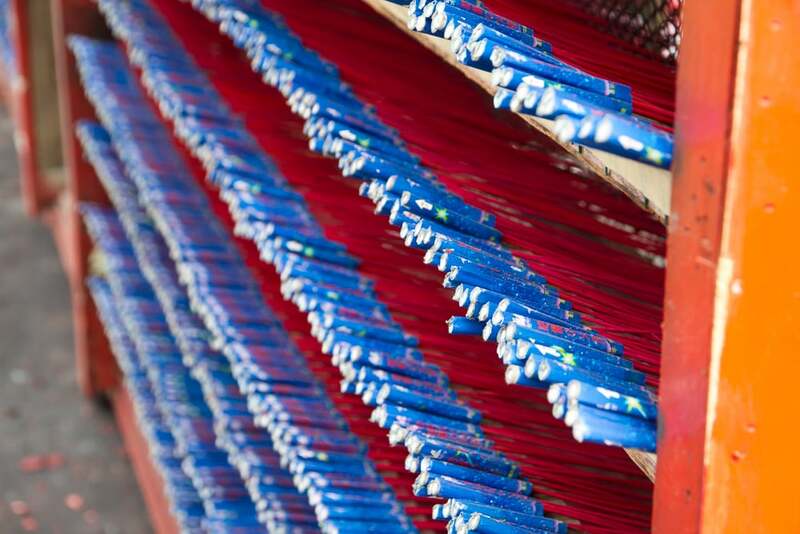 In Chinese culture, there is a traditional belief that setting off fireworks and firecrackers brings wealth and prosperity. 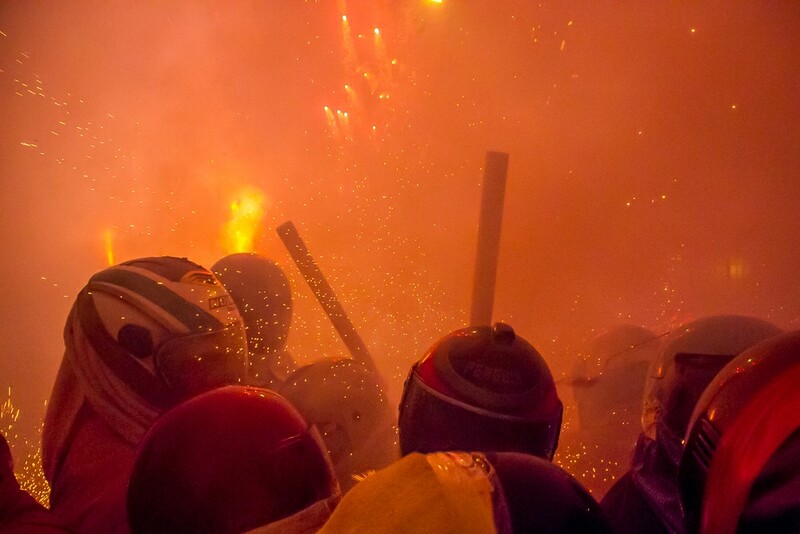 In Taiwan, like in China, major celebrations such as the Lunar New Year are celebrated with enormous fireworks displays. 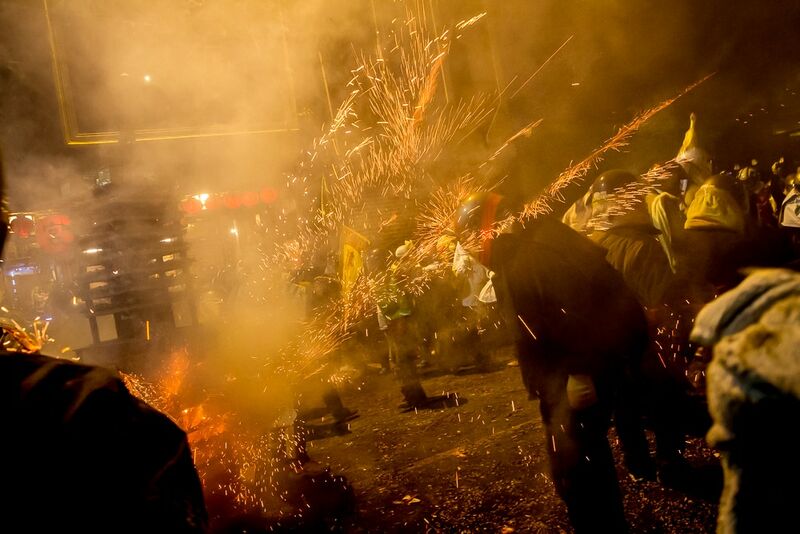 If you live anywhere in Taiwan, you also know that folk processions seem to be parading through your neighborhood every second week, and are always accompanied by firecrackers and fireworks. 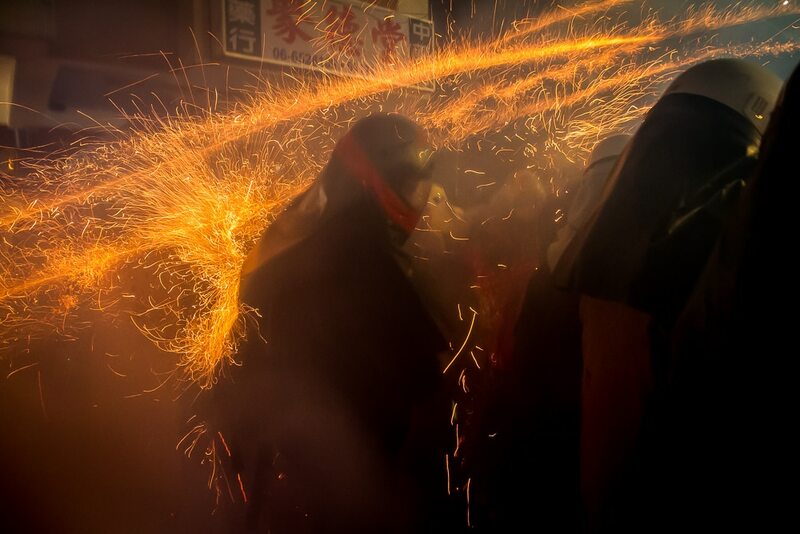 But what sets the Yanshui Fireworks Festival apart is the fact that the fireworks (bottle rockets to be more precise) are shot directly at participants! That’s right, anyone who is brave enough is welcome to join in and get pummeled with a fiery barrage of rockets. Sound intriguing (or terrifying)? 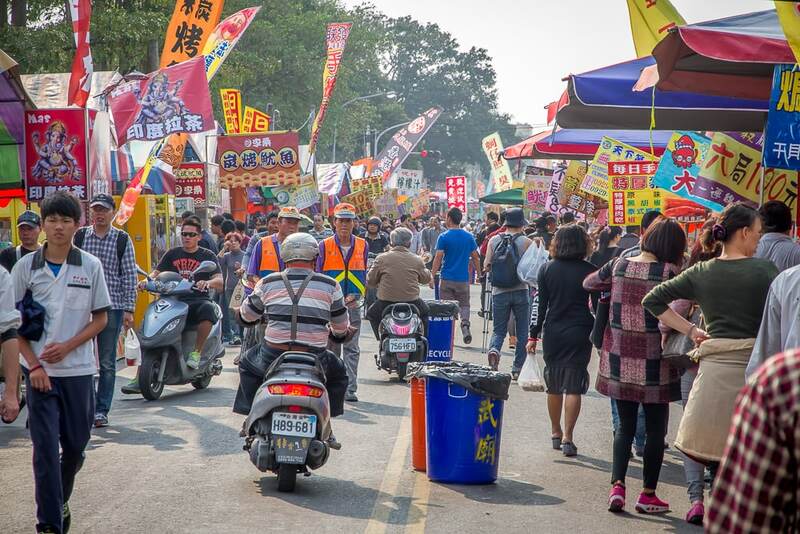 I attended this wild festival with my father in 2015, on one of the many trips my parents have made to visit me in Taiwan since I started living here in 2008. My father is a teenager at heart and loves anything involving explosions. I don’t think I ever would have willingly chose to participate in the Yanshui Rockets Festival. But when my father first heard about it before his trip, he was so excited for it that I couldn’t say no. 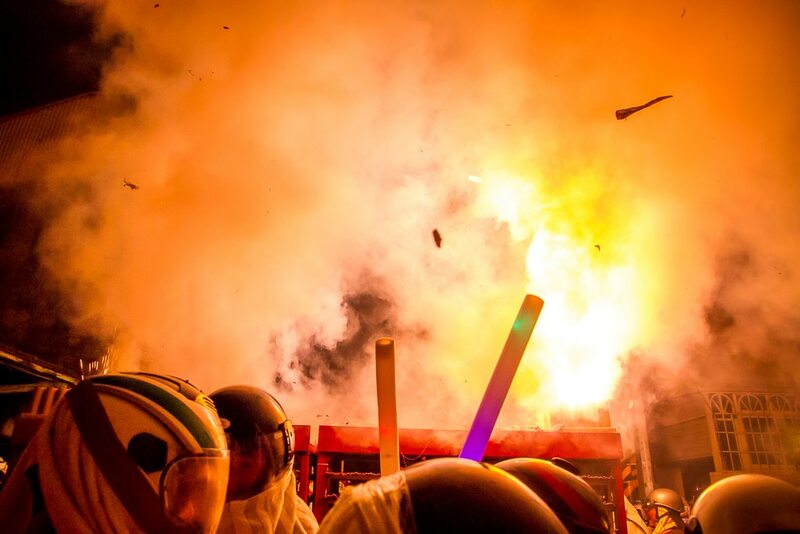 Read on to find out the origins of this festival, the Yanshui Fireworks Festival 2019 dates, how to participate, and about our wild (and truly frightening) experience. 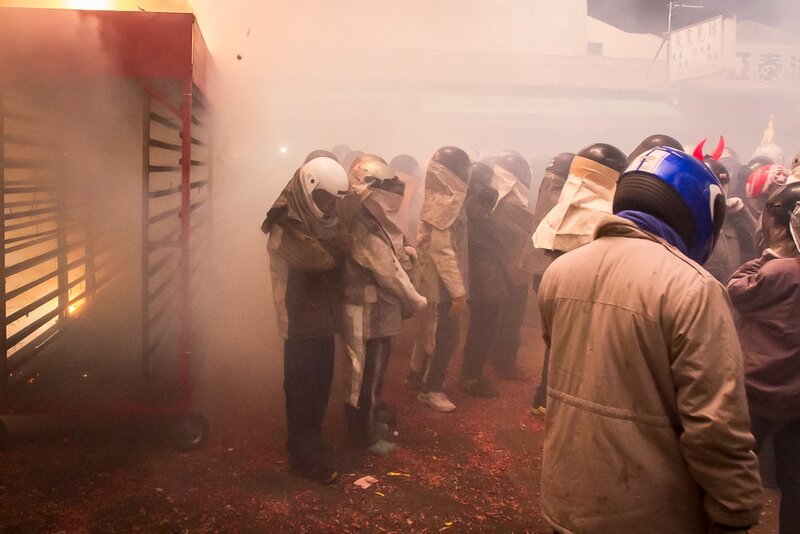 While there are a few theories, the most commonly cited story is that the origins of the Yanshui Beehive Fireworks Festival are tied to a cholera epidemic that swept through the Yanshui region beginning in 1875 and lasting more than 20 years. 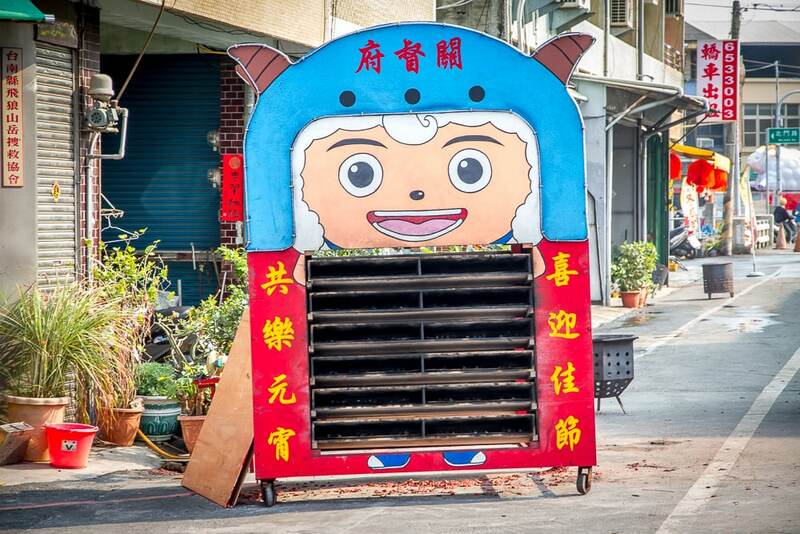 In fact, Yanshui (sometimes spelled Yenshui) is one of the oldest towns in Taiwan. 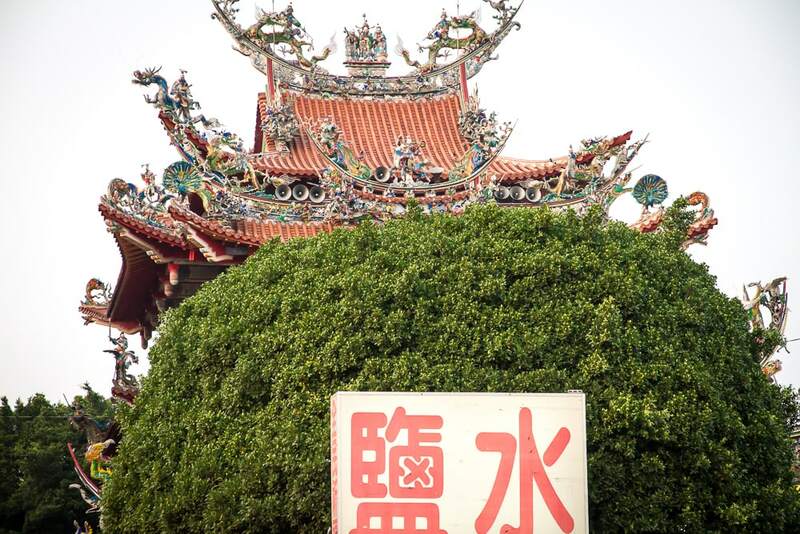 Located in present-day Tainan County, the district is roughly half way between Tainan City, Taiwan’s original capital, and Chiayi City. Until it was closed in 1900, Yuejin Harbor in Yanshui made the town one of the most important trading centers in southern Taiwan. 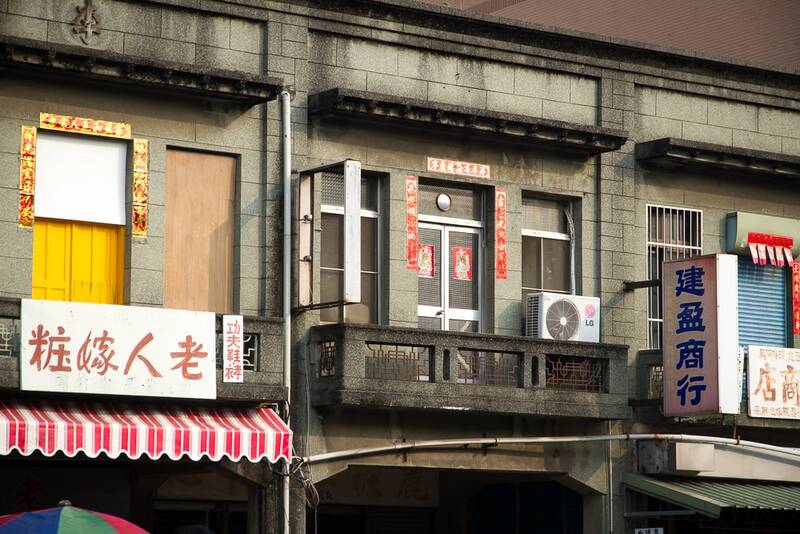 Today, Yanshui’s history can be appreciated on Qiaonan (Ciaonan) Old Street (橋南老街), one of the oldest thoroughfares in Taiwan, with a theater and blacksmith that have been in business for well over 100 years. When the region was suffering under the epidemic, survivors pled to Guan Yu (also known as Guan Di, Guang Gong, or the God of War) at the local temple dedicated to him, Yanshui Wu Temple (鹽水武廟). 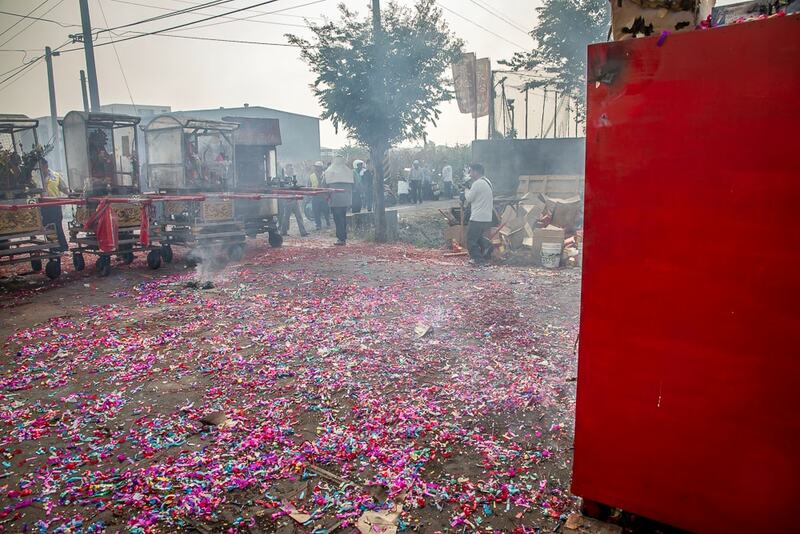 To drive out the evil spirits causing the epidemic, the locals paraded a statue of Guan Yu around the area on a palanquin, setting off enormous drumfire strings of firecrackers en route. The method seemed to have worked; the epidemic receded, and an annual tradition was born. 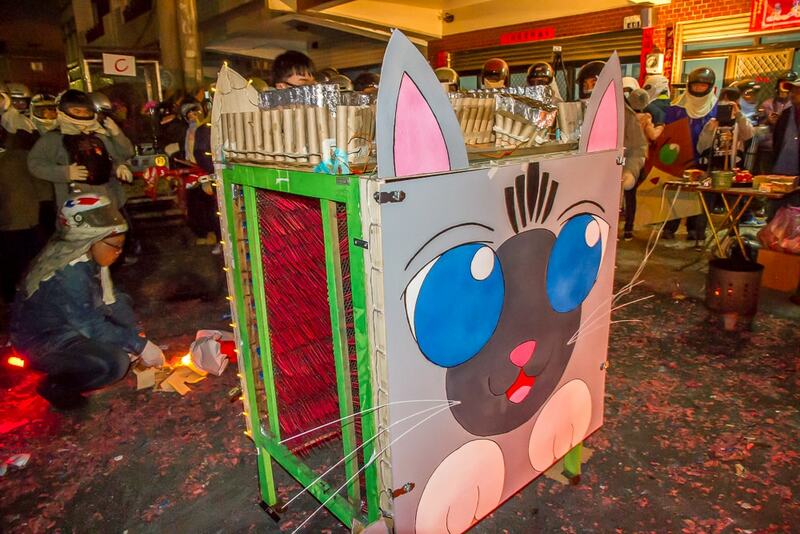 In the beginning, locals would set off firecrackers in the direction of the palanquin, as is done with most folk religious street processions in Taiwan. 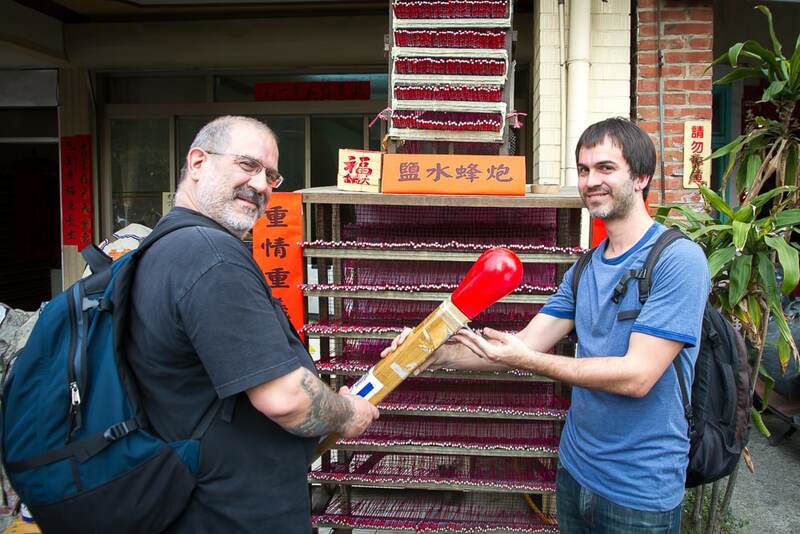 However, after WWII, the locals in Yanshui kicked it up a notch by using bottle rockets instead. In the early 1980s, they began creating layered platforms on which the rockets could be placed, often facing in multiple directions, resulting in participants getting hit by them. 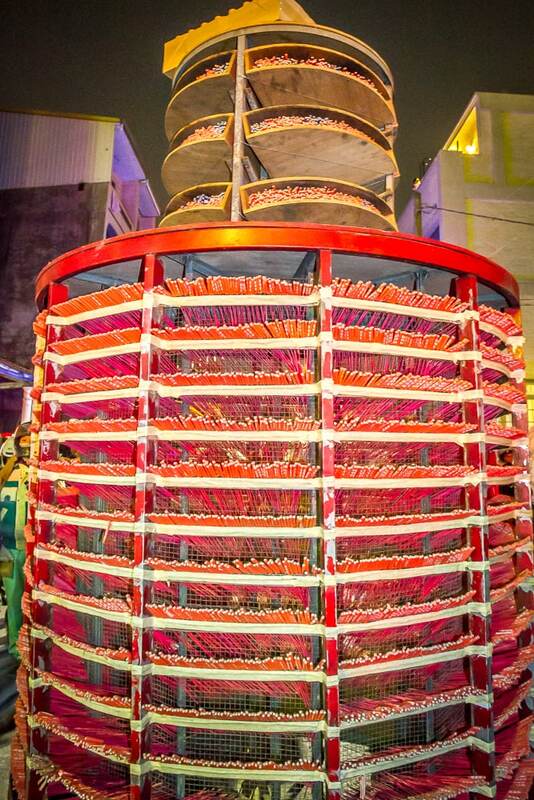 One rocket tower can contain thousands of individual rockets! Notice what she’s hiding inside? One rocket tower that was developed had a round shape and fired rockets in all directions at once. 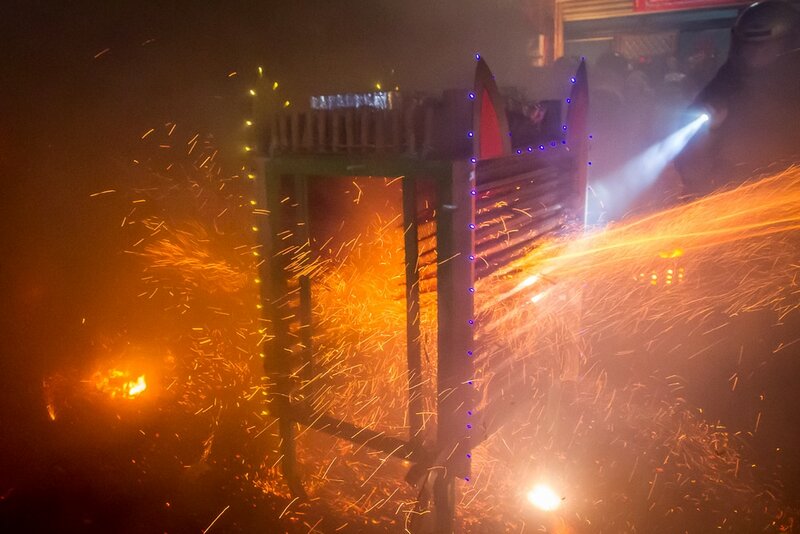 It’s shape and appearance was somewhat akin to a beehive, hence the name Yanshui Beehive Rocket Festival. The classic “beehive” rocket tower, which shoots rockets 360 degrees. The rockets themselves also became louder and more powerful over time, as the internal paper wad, the material that keeps the gunpoweder in place, was replaced with plastic. Today, locals consider it lucky to be hit by a rocket, and the more you get hit with, the luckier you will be. 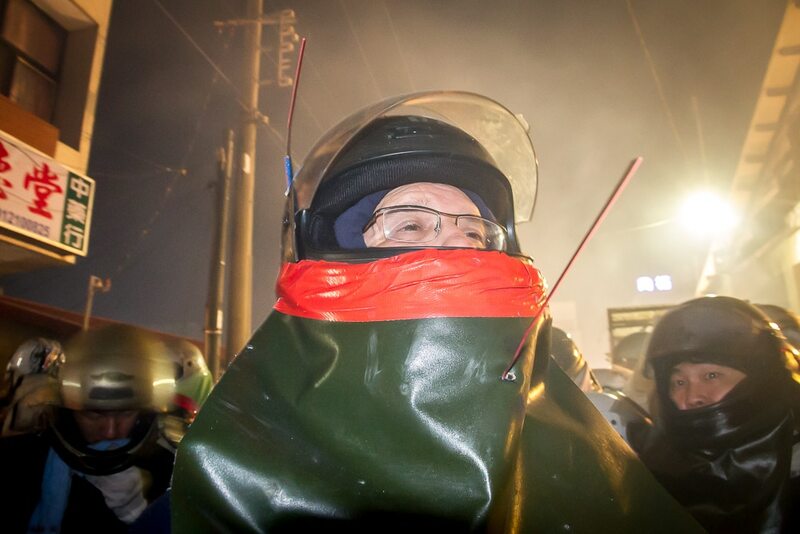 Many, including my crazy dad, go to Yanshui specifically to be hit by the fiery rockets. Standing right in front of one of the hundreds of rocket towers that are placed throughout the district during the festival, you are guaranteed to be hit multiple times, as we soon found out. 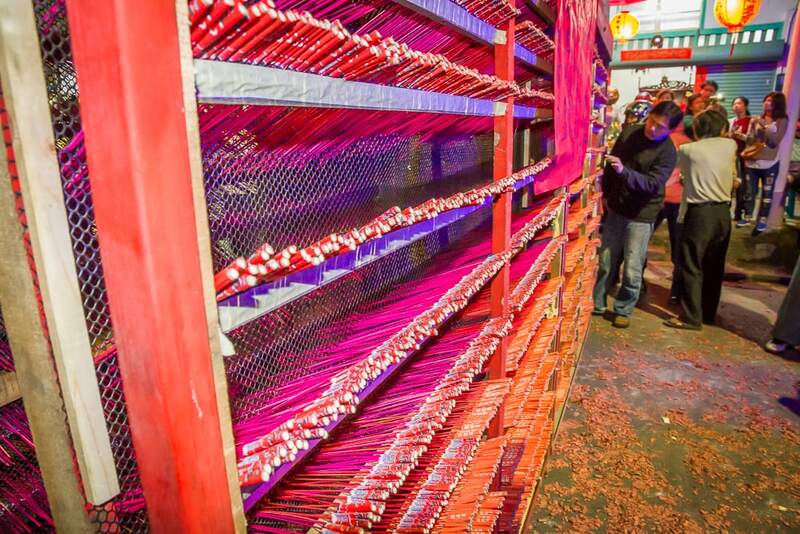 The tradition in Yanshui was always to hold the fireworks festival on the 15th day of the first month of the Lunar Year, which usually falls sometime in February. The date coincides with the Lantern Festival (Yuan Xiao Jie or 元宵節), a popular festival celebrated across the Chinese-speaking world. 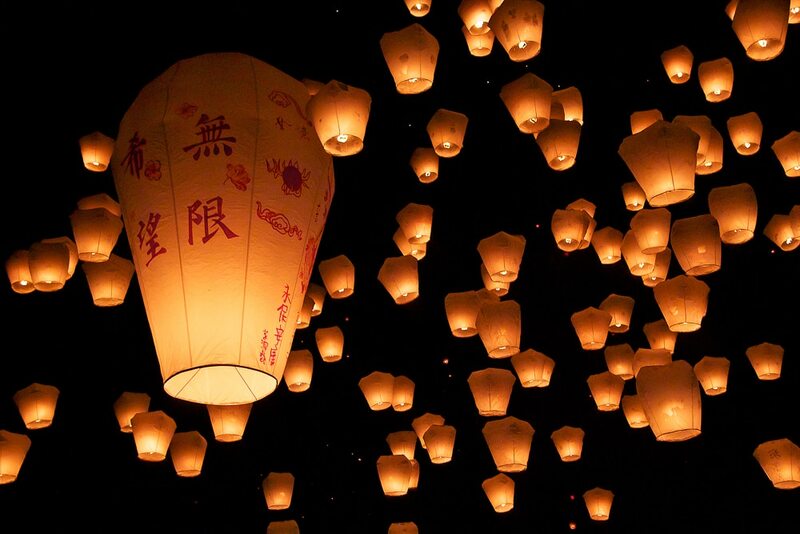 In Taiwan, the Lantern Festival is usually celebrated with stunning displays of large, creative lanterns in cities throughout the country as well as the famed mass Sky Lantern Release in Pingxi, New Taipei City. 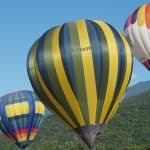 In fact, the Yanshui Rockets Festival is not the only wild event that takes place on the Lantern Festival. 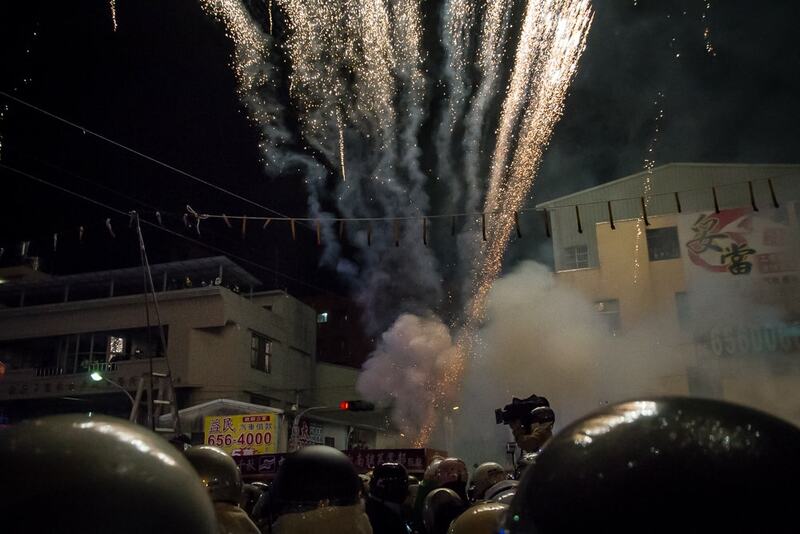 Over in Taitung, locals willingly subject themselves to being hit by firecrackers and rockets in the Bombing of Lord Handan Festival, while a lesser known folk festival in Taipei involves the Bombing of Tudi Gong, the Earth God, with a ridiculous amount of firecrackers. 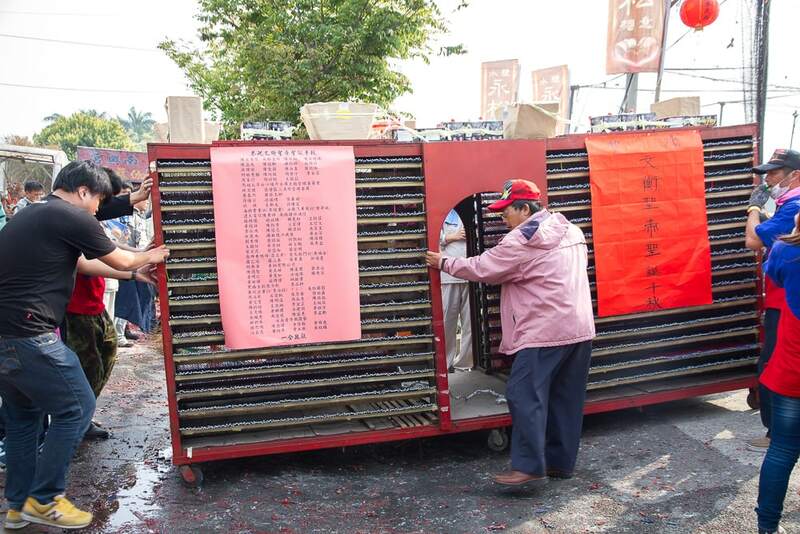 Over time, the Yanshui Fireworks festivities became so long that a second day was added, on the 14th day of the Lunar New Year. 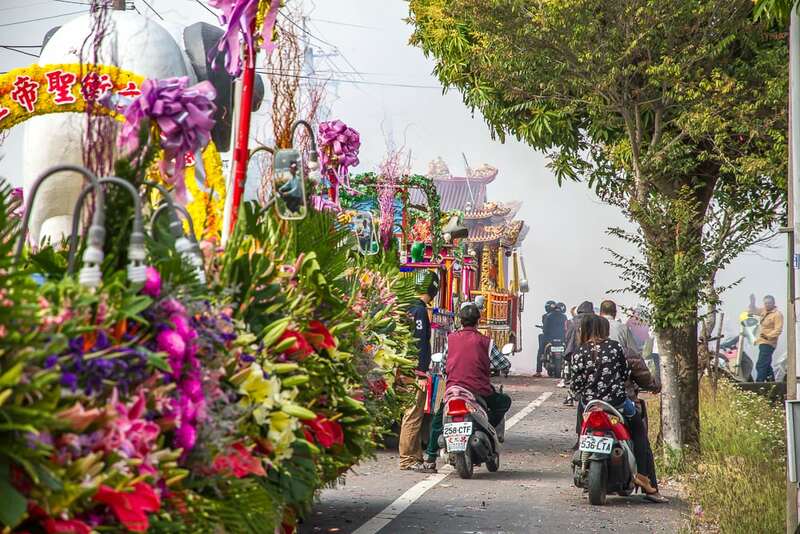 Customs and processions typically begin in the morning on the first day, but the main event that most people visit for begins around sunset (6pm) on the second day (always the same day as the Lantern Festival). 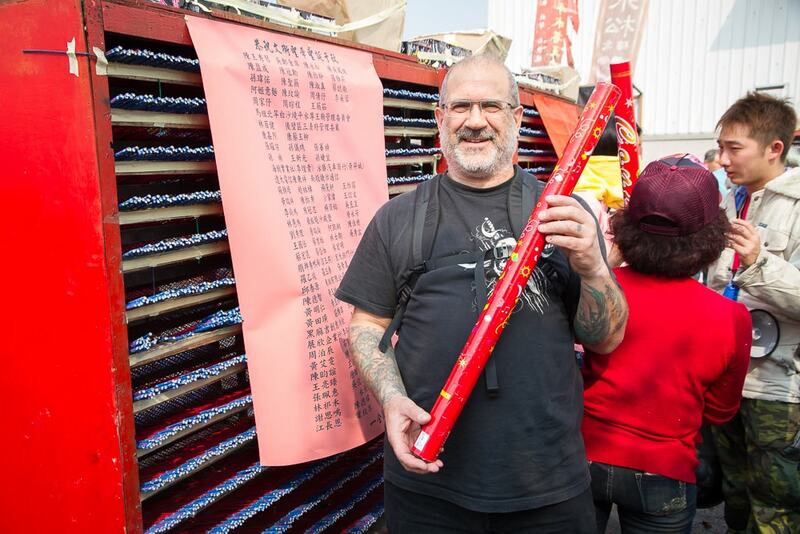 The Yanshui Fireworks Festival 2019 dates are Monday, February 18 and Tuesday, February 19, so if you are planning on joining, you’ll want to be there on Tuesday evening. 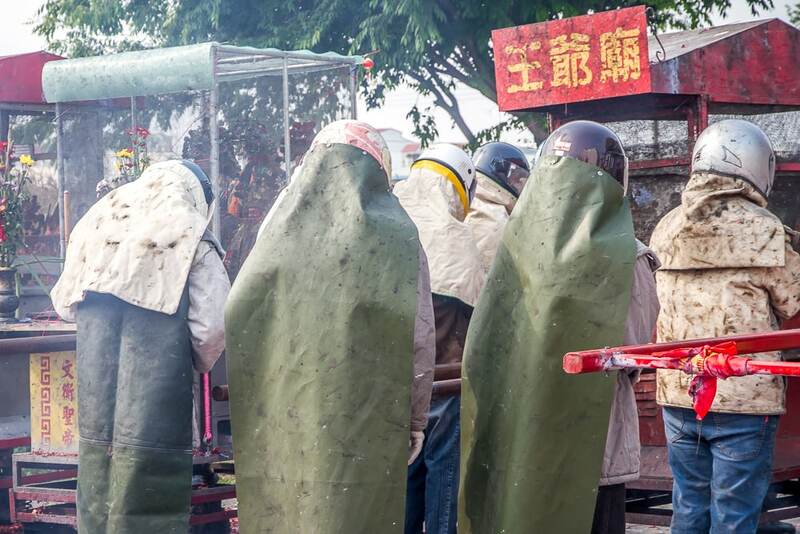 I would suggest arriving in Yanshui in the late afternoon on the main day so that you have time to explore the town, eat dinner, and prepare your protective clothing (see below). My father and I caught the High Speed Rail from Taipei to Chiayi Station. From there, it cost us 350 on the taxi meter to get to Yanshui. Note that when we left Yanshui, we had trouble to find a taxi to return to the HSR station. We had to walk a ways out of town, and ended up asking a police officer to call one for us. During the festival, there are also free shuttle buses from the nearest train station, Xinying (Sinying). Another option if you’re coming from Taipei, Hsinchu or Taichung is to catch a ride by joining this event page on Facebook! If you want to stay overnight in Yanshui, try Cubilose Homestay (see prices and reviews) in town, or OHYA Boutique Motel (see prices and reviews) about 30 minutes walk from the town center, but you’ll want to book these very far in advance if you want any chance of getting a room. Arriving in Yanshui, our taxi was not able to get right into the town because a procession was blocking the road. Soon after we were let out, we were already standing face to face with our first rocket tower, in broad daylight. The menacing tower had just been rolled out onto the road from a garage, and a group of people in full protective gear ready to face the fire. Within seconds, a group of people arrived carrying a palanquin and began shaking it furiously in front of the rocket tower. 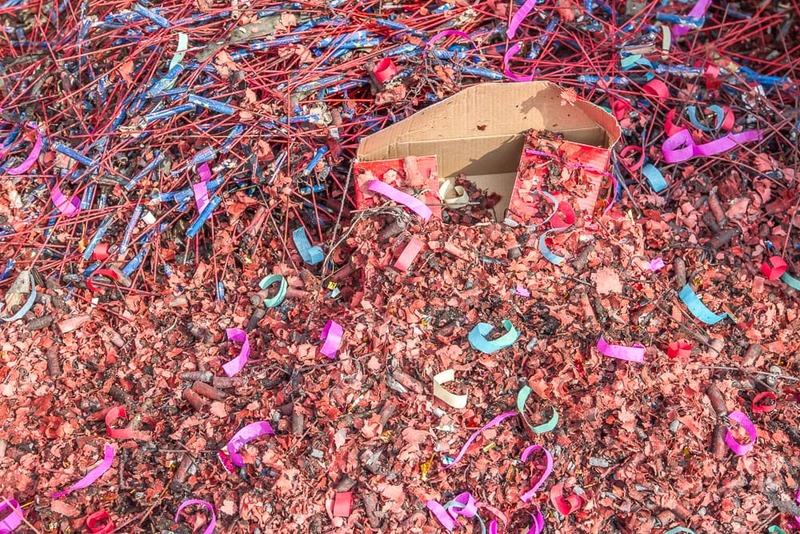 The participants then set off explosions of confetti from colorful tubes, which rained down upon us, and then the rockets began firing rapidly in succession. My Dad and I didn’t have any protective gear on at that point, so we had to run and jump behind a wall. I got hit by a single rocket, of all places, right in my crotch. Right in the middle of it, Dad, who was beside me watching ecstatically, hands covering his ears, took off the mask he’d brought to remove a chunk of wreckage lodged between it and his face. The experience struck fear into my heart. The deafening sounds and rockets flying over my head made feel like I was in a war zone. My Dad was thrilled and wanted more, as soon as possible. I admit I had an adrenaline boost as well, but I was more concerned about getting into town and buying safety gear as soon as possible. 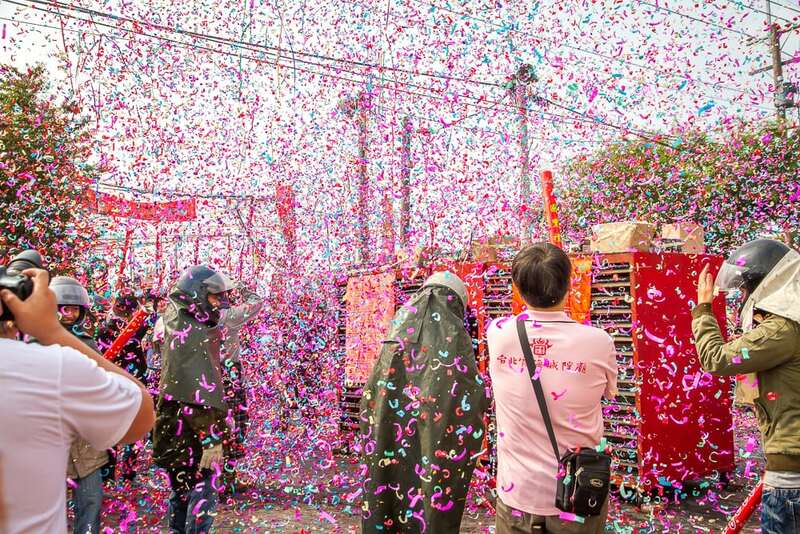 Yanshui, usually a sleepy backwater, takes on a festive atmosphere during the two days of the event. Yanshui Night Market, which leads to Yanshui Wu Temple, where the festival begins, was growing more crowded as dusk neared. 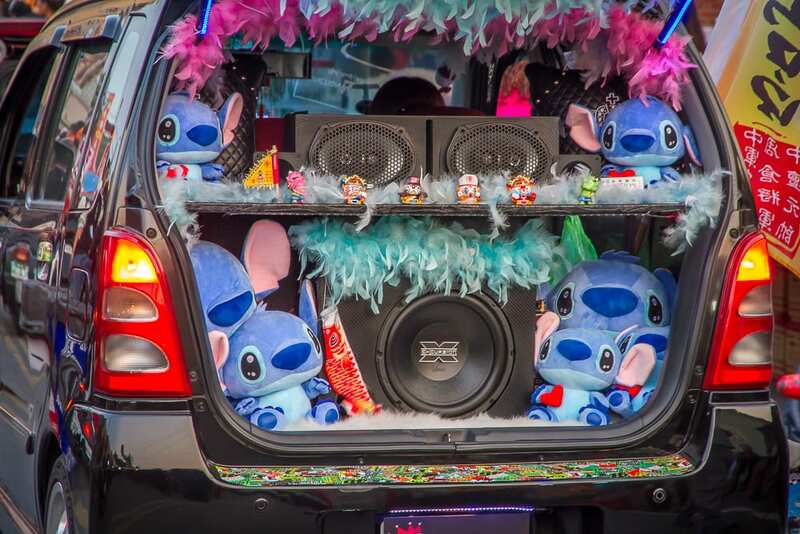 Approaching the temple, decked out cars and parade floats carrying scantily clad dancing girls squeezed through the crowd. At the sides of the night market, local teens played a game common in southern Taiwan of trying to toss a firecracker into a lantern hanging high up in the air and making it blow up. 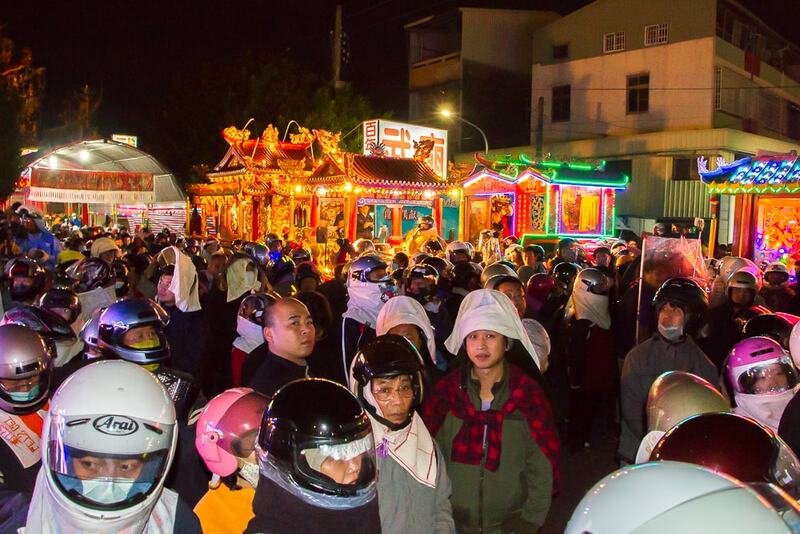 The Yanshui Night Market branches out into little lanes where you can find numerous stalls selling appropriate safety gear. I would suggest wearing jeans and a thick jacket made of a material that isn’t flammable and can’t melt. 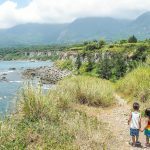 You may want to bring your jacket in a backpack and it can be quite warm even in winter in the south of Taiwan. You should also wear good, solid shoes, and be aware that any clothes you wear may be destroyed. 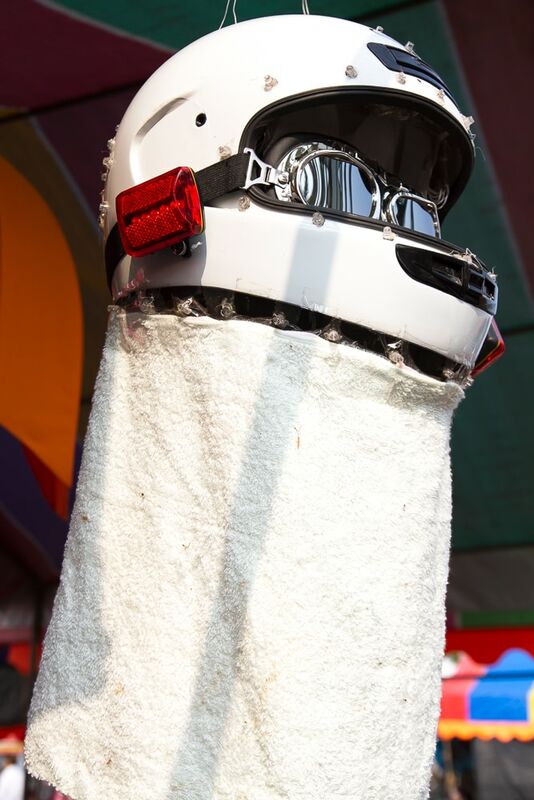 Upon arrival in Yanshui, it is advised that you complete your safety outfit by purchasing the following, if you didn’t bring them: a helmet that covers your whole head and face, a towel to protect your neck and prevent stray rockets from flying up into your helmet, and gloves. We had read earlier that towels around the neck aren’t actually the best idea, even though many sites recommend them, as they tend to be highly flammable. 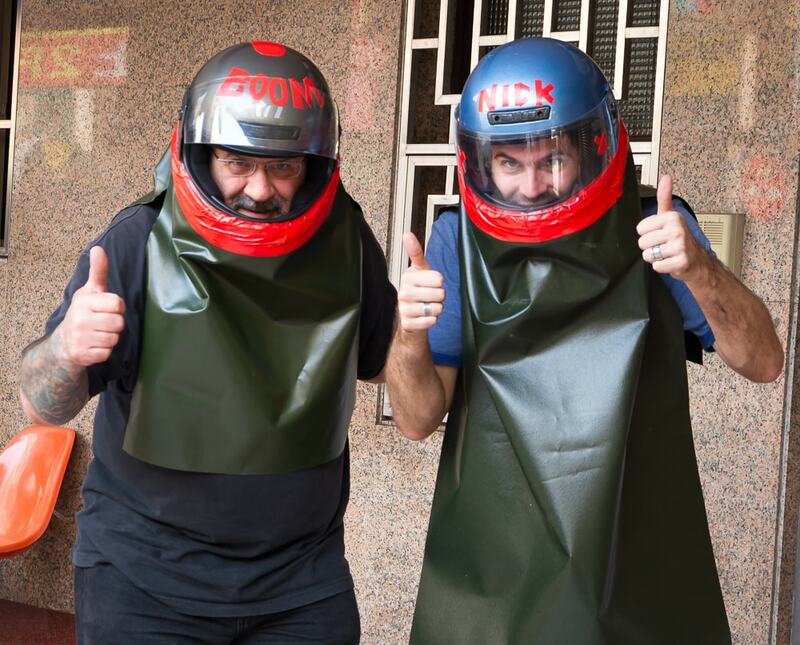 We noticed that some locals had custom-made gorgets (front hanging covers) and aventails (back hanging covers) made of a non-flammable material taped to their helmets, which seemed like a much better solution. We didn’t have to wander too long through town to find a local shop selling the perfect material, and then we went to work cutting and taping the fabric to the helmets we had just bought using good tape that we had brought from home. Another warning: the helmets tend to fog up from your breath during the event, but you must resist the urge to open them while in the event area. Also, it is quite common for people’s clothing to start on fire, so I’ll discuss more safety advice below, and a strategy that we picked up to avoid this. The Main Event: Let the Shots Begin! After dark, the crowd of people at Yanshui Wu Temple got increasingly thick, and the feeling of anticipation grew. Dispersed among the crowd were numerous groups with effigy palanquins, each of them numbered. 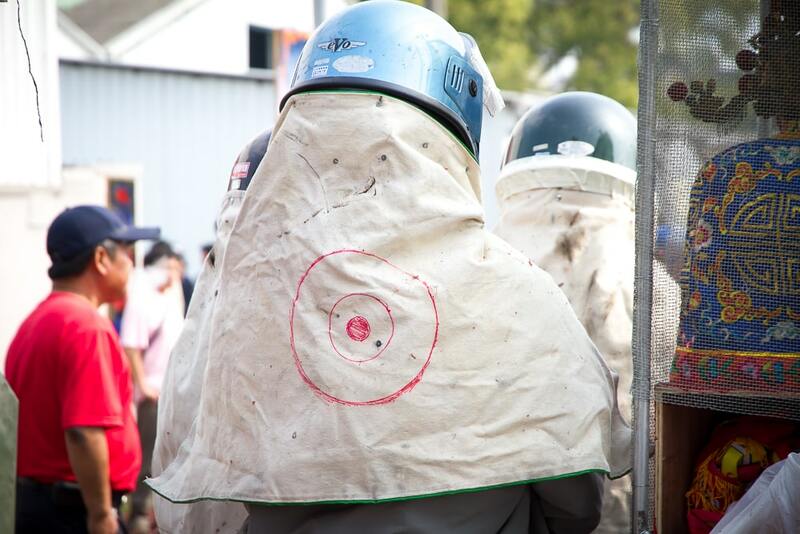 We honestly didn’t know when shots were going to start going off, and many others shared our feeling, as every time there was an increase in noise, they would start putting on their helmets. There’s no mistaking when it begins, though. Suddenly we noticed that EVERYBODY was wearing helmets, so we quickly put ours on too. Drumfire strings of firecrackers tied across the courtyard above our heads rained sparks down upon us, and then a wild display of fireworks went off in the sky in front of the crowd. Next came the first round of rockets, shooting over our heads but not quite hitting us. People around us starting bouncing about, which we later realized is a way to prevent rockets that hit you from getting stuck and lighting your clothing on fire, and avoid melting your shows by standing on rockets on the ground. The palanquins began pushing through the crowd and making their way down a side street one after the other, with the crowd squeezing along with them, ever so slowly. We were stuck somewhere in the middle, and hearing bursts of explosions going off up ahead, we started to feel as though we were missing all the action. But we would soon have our chance. We decided to veer off from the main crowd down a side street, hoping to intersect it up ahead. But on the small side street we were suddenly facing a wall of rockets, standing patiently like a ticking time bomb, with a small crowd standing around it in anticipation. It was just like the one we’d seen earlier that day, only bigger. “Well, this is the end of me,” I thought, as my father and I staked out a spot right at the front. Within minutes two groups of men with palanquins arrived from behind us, forcing us even closer to the walls of death. My father stood right up at the front, but I allowed a few people to get ahead of me, hoping they would shield me from the bulk of the impact. The crowd grew denser and more impatient with fear. 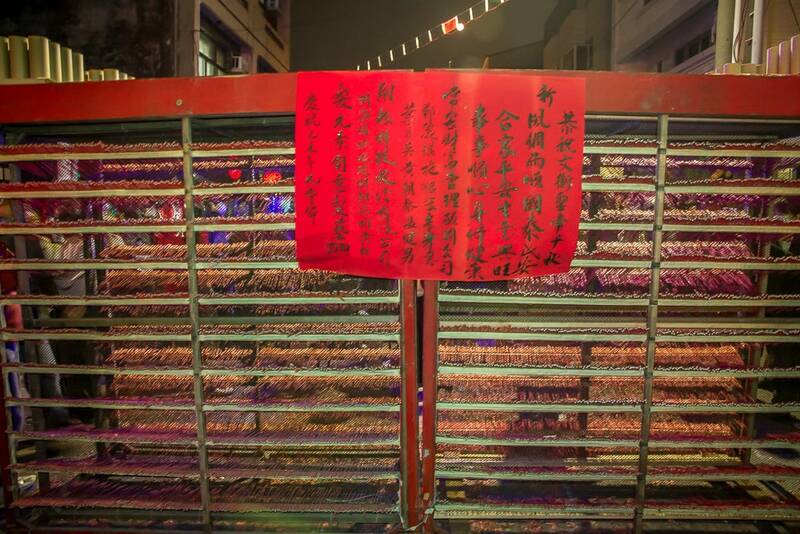 A pile of ghost money was set on fire on the ground before the wall. 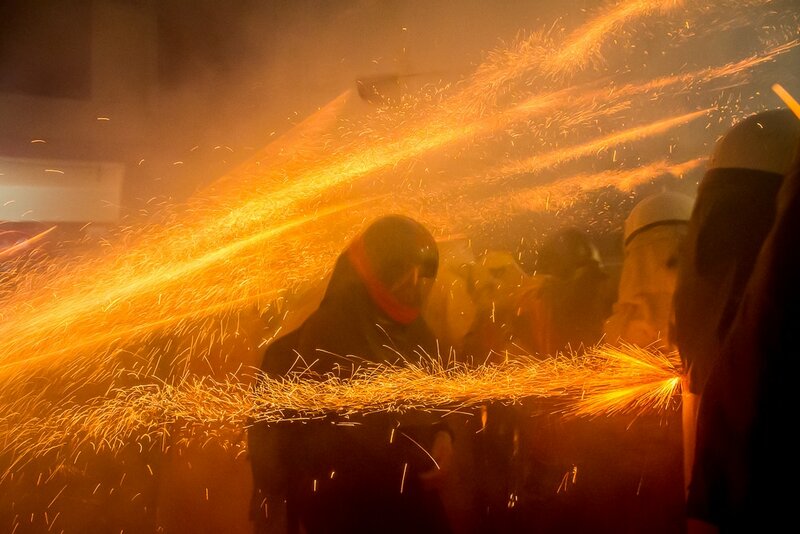 Then fireworks started erupting from the top of the rocket tower, exploding in the sky above and lighting up the apartments on either side of the narrow, gorge-like street. They went off for quite some time, as if to drive us mad with anxiety. The fireworks calmed, then stopped, and an eerie silence fell upon us. Then the popping, whizzing sound of the rockets started, slowly, and within seconds, began going off like several machine guns being fired in unison. 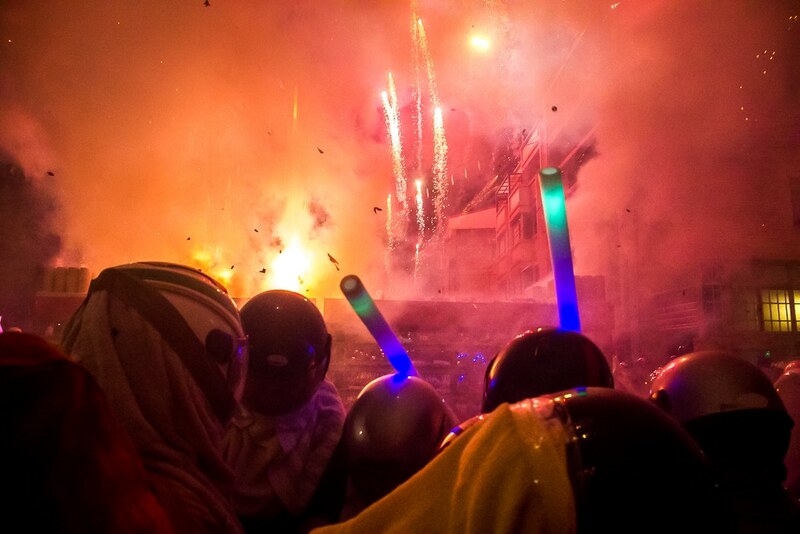 Lights and sparks exploded all around us, people crashed into each other like in a punk rock mosh pit, and the rockets struck all over my body, each one as painful as the hit from a paintball gun. It was sheer chaos. Bouncing was essential, as some of the rockets were pointed low, and could easily stick to and catch our clothes on fire. It’s crazy to say but you don’t even notice if your clothes catch fire because you’re so padded up and there’s so much movement and insanity happening all around you. Finally the explosions died down and ceased. I noticed that many locals had turned their backs to the rockets, just standing there stoically enveloped by plumes of smoke. We endured 4 or 5 more rocket platforms before leaving Yanshui, but mostly I stuck to the sides trying to take photos (see my photography tips below) and watching my Dad get pummeled. 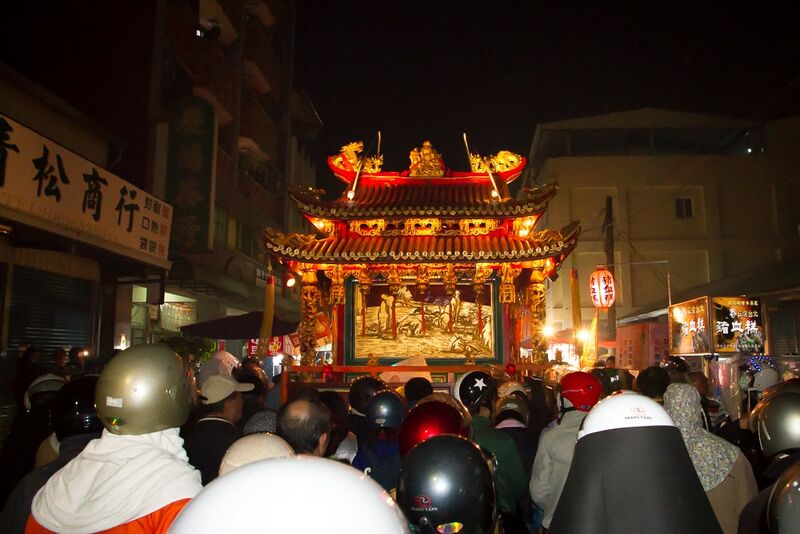 While there is a set route that the procession takes through Yanshui, beginning in the town center and then moving outwards in the district later at night, we found it impossible and unnecessary to really know what the route was or try to follow it. There were just so many people everywhere, and multiple walls of rockets being shot off at any given time on different streets. All you have to do is follow the noise, or find a rocket tower than hasn’t gone off yet and wait for it. As we were leaving, we saw three separate things that really drove home how dangerous this festival is. The first was a really tall (one head above the crowd) white guy that had been standing at the back of the crowd with no helmet, and had been nailed right in the forehead with a bottle rocket. He was giggling like an idiot about it, as blood was literally spurting out of his head. Second, as we headed back in the direction of the night market, which was now overflowing with people, we noticed just how close it was to parts of the rocket firing area. Like only one block away. It seemed very plausible that a stray rocket could make it that far and pelt an unexpecting market-goer right in the head. Nobody seemed concerned. Third, as we followed a road out of town trying to get a taxi, we saw locals cruising around and randomly shooting off fireworks from the back of trucks, sometimes aiming them dangerously close to people walking along the road. 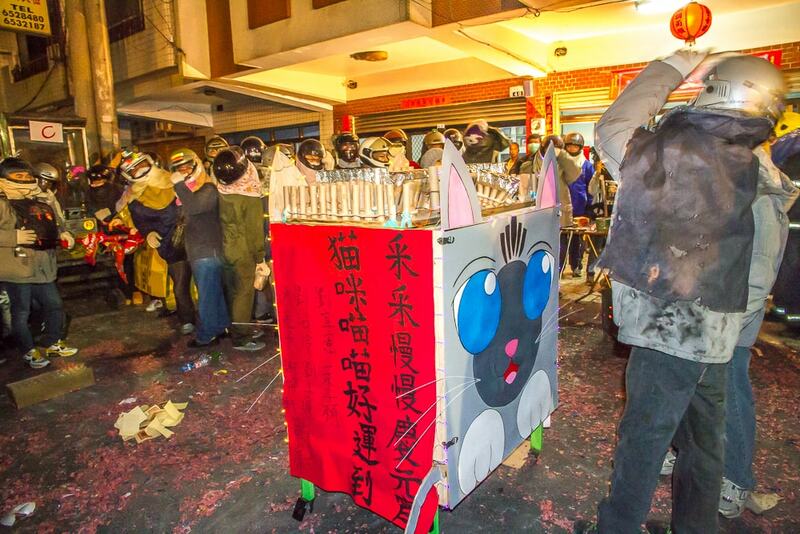 All in all, I would consider it a safety risk to be anywhere in Yanshui during this festival, especially in the night market area, even though so many locals do it. And if you do participate, it is likely that you will take your helmet off sometimes from being too hot. 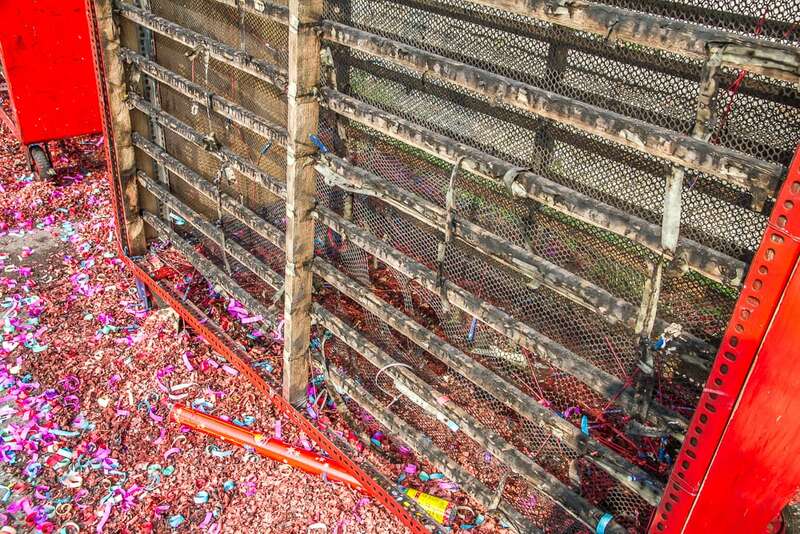 But even when you aren’t standing in front of a wall of erupting bottle rockets, there is still always the danger of stray rockets coming out of nowhere, or unexploded rockets on the ground igniting and firing off at any time. Every year, multiple people are injured. 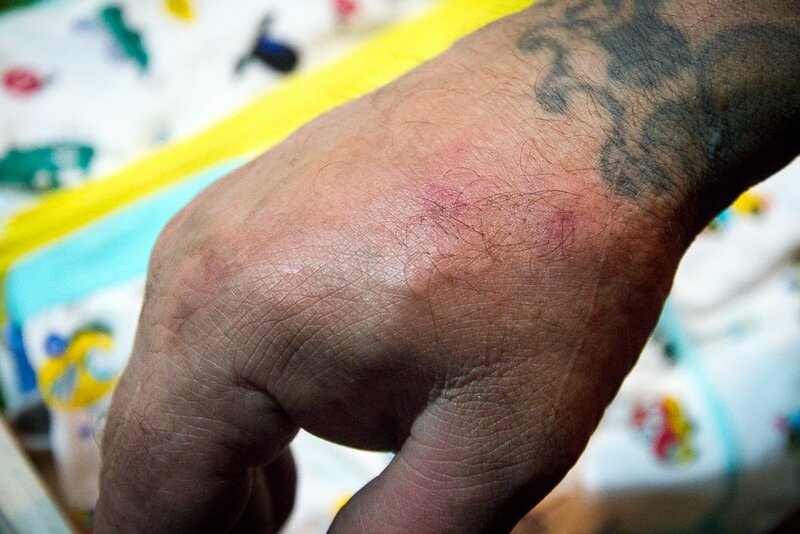 I’ll spare you the pictures of the rest of his body, but it mostly looked like this. Taking out a camera of any kind during the event is a risk, as it could easily be dropped or damaged by a rocket. 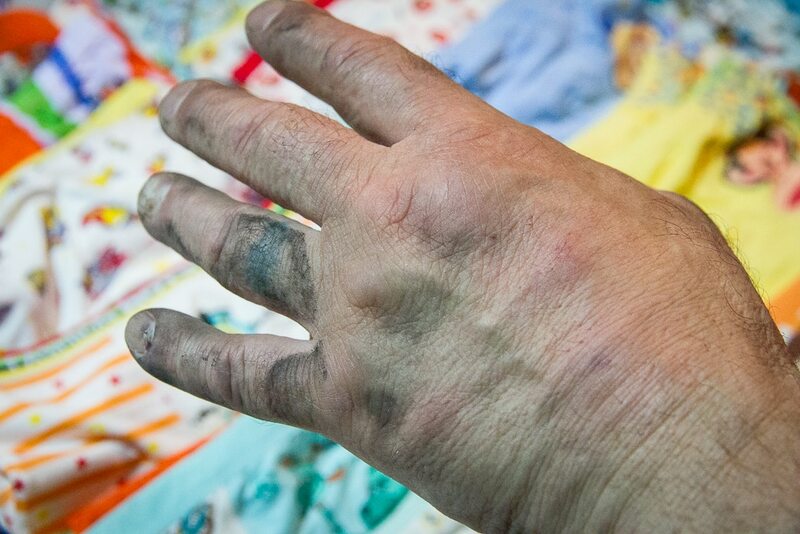 Even if you only use a cell phone, this comes with the same risks, as well as the risk of burning your fingers if you take off your gloves to press the shutter. If you plan to bring a larger camera or DSLR like I did, having that long front-hanging cover on my helmet was great for concealing my camera at my chest. I purposely made mine longer than other people’s for that purpose. 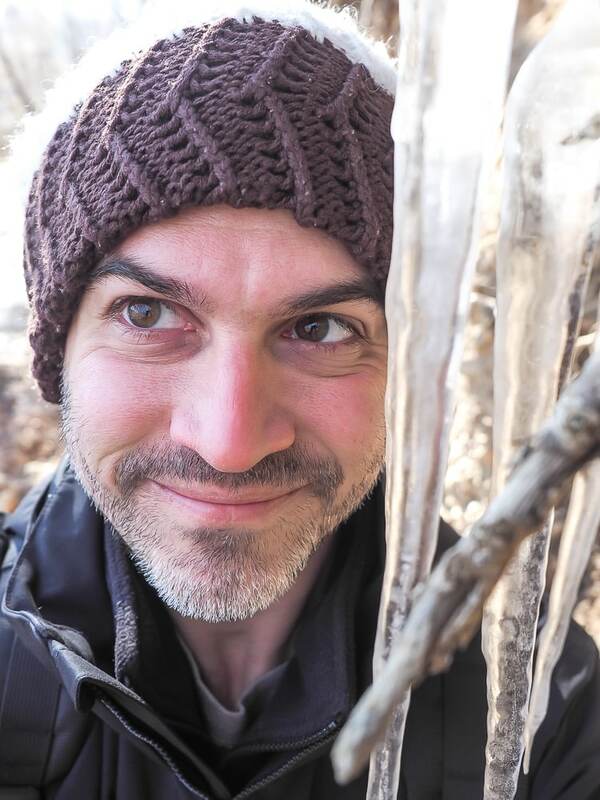 I also cut the end of one finger off my right-hand glove so that I could press the shutter. Still, you must be aware that any exposed skin is at risk of being burned by flaming rockets. I’d also recommend putting a cheap UV filter on the front of your lens if you don’t have one already. Finally, be aware that it’s really tough to get decent photos if you’re in the crowd. 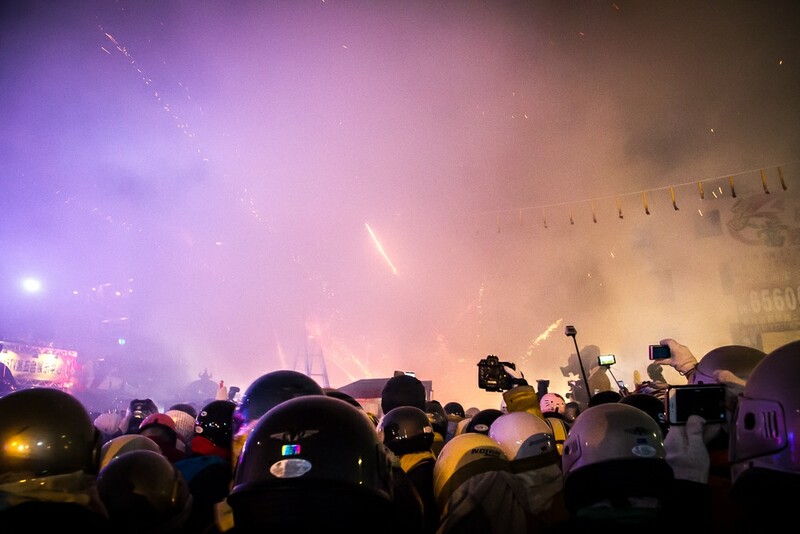 It’s dark, extremely crowded, people smash into you, and who can take good photos while being shot with rockets? Standing on the side is a better option, but also note that the air quickly fills with smoke after the rockets start going of. 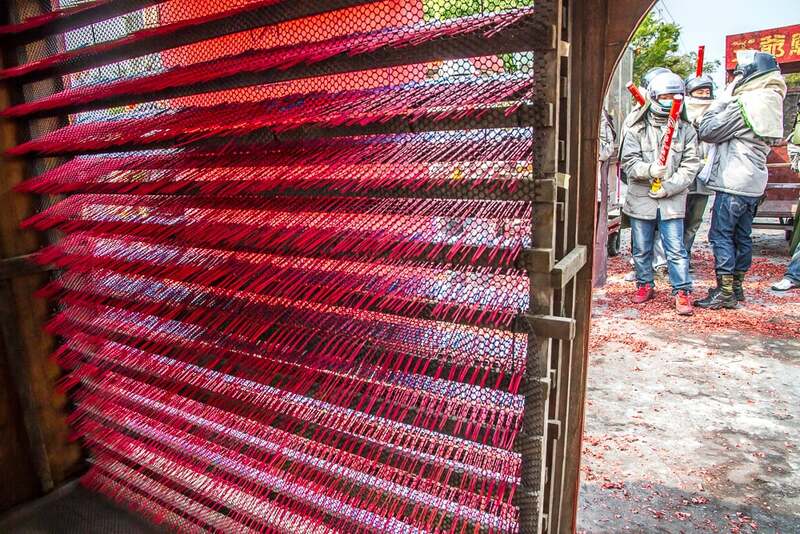 For more photography tips and great photos of the festival, check out this Yanshui Beehive Festival photography guide, as well as this awesome video of the event. A true father-son experience to remember.